The female leader (Carol Forman) of an international crime ring steals a valuable artifact that can give her the power to control men's minds. 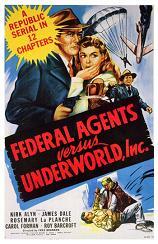 Federal agents (Kirk Alyn and James Dale) are dispatched to get it back and stop her evil plans. Also stars Rosemary La Planche and Roy Barcroft.